Skinny Chicken Fajita Soup Recipe – a zesty, low fat, gluten free meal with an easy low carb option! This skinny soup recipe is exactly what you need. I just can’t get enough soup this time of year. Neither can my family. They would eat soup every day if I made it for them. Any soup is a good idea when it’s so frigid outside. Yet we especially love soups with bold flavors and spices! 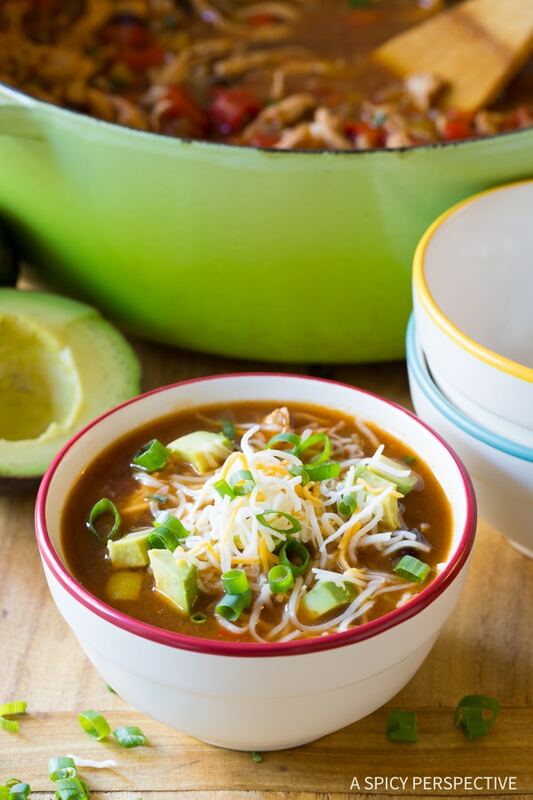 Today’s Skinny Chicken Fajita Soup Recipe is a meal you can enjoy all through the winter months, even when you are watching your diet. 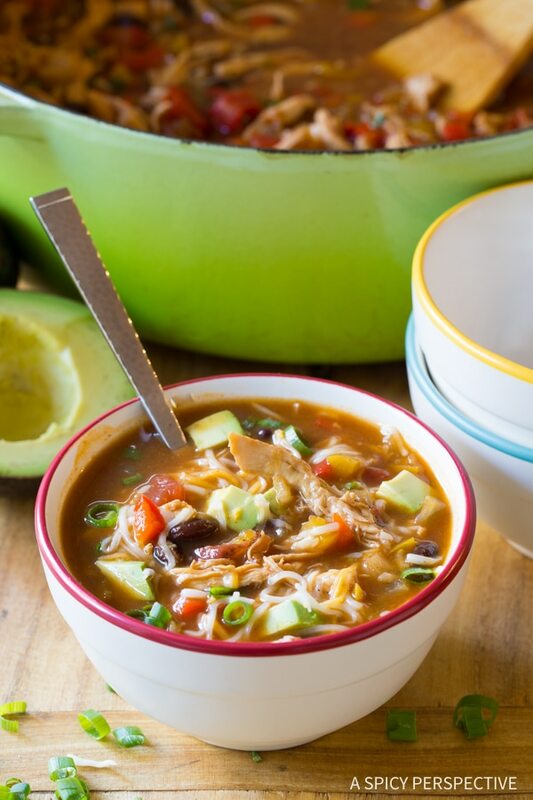 If you love Chicken Fajitas, Skinny Chicken Fajita Soup offers the same type of comforting Mexican appeal, with a unique taste and texture. This skinny soup is low fat, gluten free, and it only has good carbs from black beans and brown rice. However, if you want to make a low carb option, just take out the rice. In a large pot, sauté chopped bell peppers, onions, and garlic to soften. Add whole chicken breasts, black beans, diced tomatoes, chicken broth, fajita seasoning packet, and salt. If adding rice, stir it in with additional water. Bring the soup to a boil. Lower the heat, and simmer. Use tongs to remove the cooked chicken breasts. Allow the soup to continue simmering to fully cook the rice. Allow the chicken to cool for a few minutes, then shred with two forks. Voila! (See the recipe card below for more detailed instructions). How Much Does This Chicken Fajita Soup Recipe Make? 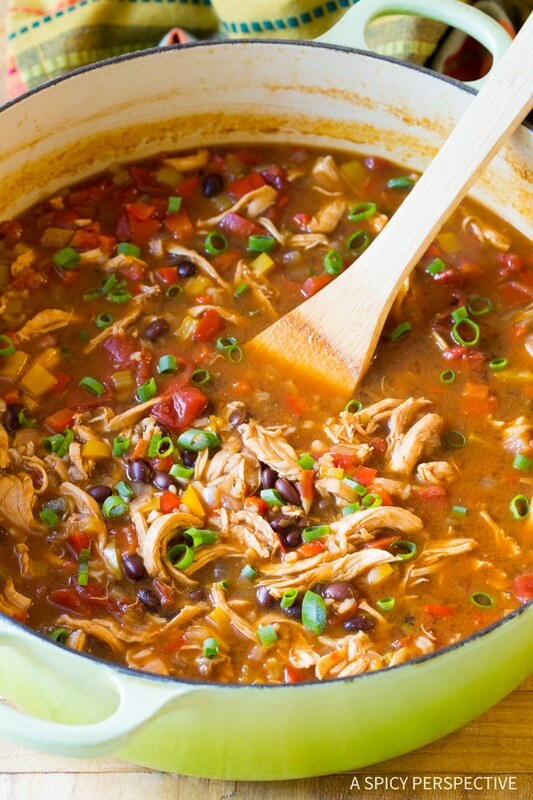 This Skinny Chicken Fajita Soup Recipe makes a large batch (about nine cups!) Enjoy it tonight, and freeze the rest for a busy night next week. 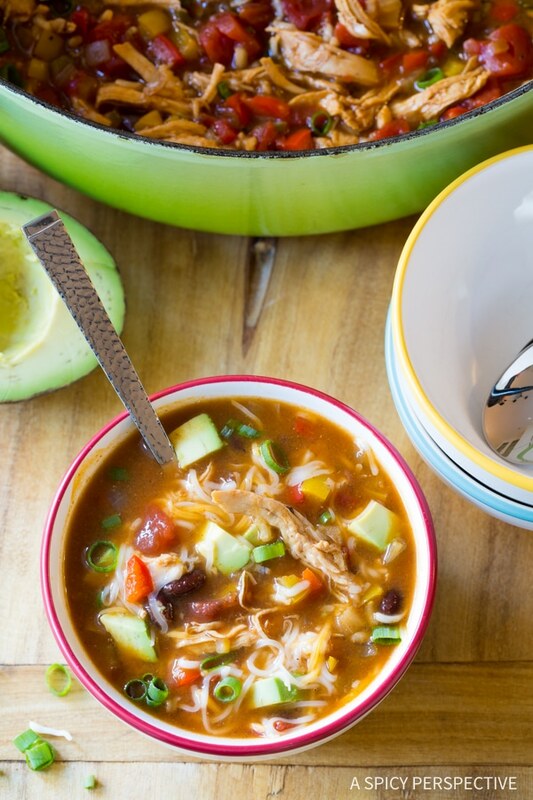 Watch the Video & Check the Recipe Card to See How to Make Skinny Chicken Fajita Soup! This Skinny Chicken Fajita Soup recipe is a zesty, low fat, gluten-free meal with an easy low carb option! This skinny soup recipe is exactly what you need. Add whole chicken breasts, black beans, diced tomatoes, chicken broth, 1 fajita seasoning packet, and 1/2 teaspoon salt. If adding rice, stir it in with an additional 2 cups of water. Bring the soup to a boil. Lower the heat, and simmer for 20 minutes. This soup has a nice light fajita flavor. If you like a more robust soup, use the fajita packet + 1 teaspoon ancho chili powder, 1 teaspoon cumin, and 1 fresh chopped jalapeno. For a low carb option, omit the brown rice. I would love this, but it has way too much sodium…I see “healthy” recipes all over, but hard ever is one low sodium. Can you imagine 3 meals in one day with about 1000mg sodium in each. For me, that is way worse than a low carb item. This soup was delicious and easy. My husband said he thought the leftovers were even better! Thanks for another great recipe! Perfect soup when the weather is as cold as it is currently outside. So happy to have found this recipe. It is going on the weekly rotation. Loved this soup and it was so easy! I kept the rice out and added corn. I Will definitely make this again! This soup was so easy to whip together! I’ll be making it again soon! Delicious! I love this soup! I squeezed lemon over top of it and it heightened the flavor. And the avocado is nice on it as well. I will definitely make it again! Easy to make and delicious for the winter season! Does the nutritional calculation include the rice? The recipe indicates that it is optional, so I wasn’t sure. Do you have the nutritional information for the soup with the rice omitted? Thanks! My new favorite soup! Others would never know that this is “skinny” because it has such great flavor. Instead of the stove top, I made this in my Instant Pot! I followed step 1 by sauteing in my IP. Then add the remaining ingredients and set it to high pressure for 20 minutes, followed by a quick release. Shred the chicken and return to the pot – Done! The chicken came out wonderfully tender. Because I used my Instant Pot (and didn’t lose any liquid while simmering on the stove top), I believe 8 cups of broth would’ve been too much, and an additional 2 cups water for rice was not needed. I added rice, and only used 6 cups of broth total. Instead of the fajita seasoning packet, I made a homemade version I found online (2 t. chili powder, 1 t. paprika, 1/2 t. of each of the following: onion powder, garlic powder, cumin, coriander, then 1/8 t. cayenne for some kick). Thanks for this! I was hoping there would be a version in the IP! Just to confirm you added the brown rice in uncooked with 6 cups broth? Could you do this in the crockpot??? Just returned from Mexico and was craving the flavours! This soup is delicious. Thanks so much for the recipe. For garnishes I used fresh cilantro and freshly squeezed lime. Delicious! Used fire roasted tomatoes with green chillies to give it some extra kick–yum! 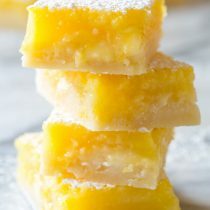 This is so DELICIOUS and easy to make!! Thank You!! Was excited to make this soup but then saw the sodium content. Yikes! Is it so high due to the fajita mix? Wondering about just adding my own spices rather than the mix. could this be made without the chicken? Even perhaps throw in shrimp to cook just prior to serving…? Why is it so high in sodium??? Is there a way to cut it? It’s most likely from the seasoning packet. Just for reference, 1 teaspoon salt has 2325 mg sodium. Was planning too. But thinking of using slow cooker. Can this be done in a crock pot and can Basmati rice be used? Yes and yes. Just be sure to sauté the veggie in a skillet first to soften them, before adding to the slow cooker. I’m making this tonight as part of my Sunday prep. Hoing to make enough for 15 servings. My family will each get 3 bowls for their week. 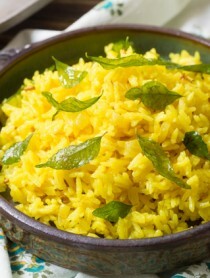 I’m going to omit the rice, and I CANNOT wait to taste it!!! 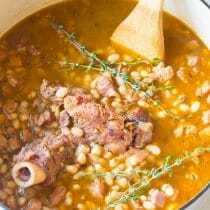 You can’t have beans on a ketogenic diet, so I’m not sure how this recipe applies. Lools really good, though. 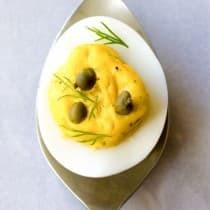 This recipe is considered “low carb” based on standard recommended nutritional values, however it is not ketogenic and is not intended to be. Low carb and ketogenic are not mutually exclusive. Always excited when I find a recipe that the entire family likes. They loved this soup!! Made it without rice, but added some roasted corn (Trader Joe’s frozen) and served with diced avocado and chopped cilantro – thank you for sharing!! 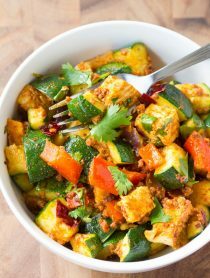 I found this recipe while searching low sodium meals. It sounded fantastic and I was super excited to make! UNTIL I saw the sodium content!! How in the world does this recipe qualify to be under low sodium meals? I don’t actually have a category for low sodium meals. Maybe you found it under low carb? Can you put noodles in this instead of the rice? Left out beans and rice and added summer squash and sweet peppers. Wow. 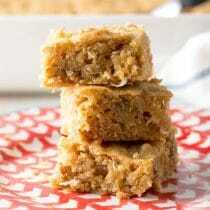 This recipe is super easy to follow and extremely good and delicious. I added vegan cheese lactose free with tofetti sour cream then added some parsley for garnish. If I could give this recipe a 300/10 I would!!!!!!! Absolutely will make at least once a week. New staple in this household. Love this great tasting soup! I make it a few times a month and eat it for dinner and take it for lunch. The right amount of spice and healthy! This soup is so delicious! It’s a favorite at our house. Thanks for the recipe! The fajita spice packet, broth, canned beans and canned tomatoes would attribute to the sodium! 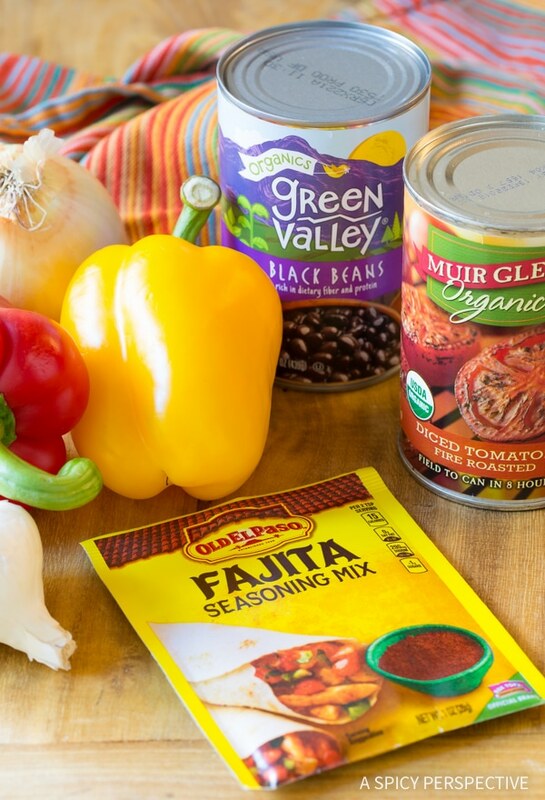 My suggestion would be making your own fajita spice and omit or reduce the salt, use reduced or no sodium broth and tomatoes and use dried beans instead of canned. Which is exactly what I’ll be doing when I make this later! I would guess the addition of riced cauliflower and the Rotel were why your soup was so watery. Definitely reduce the broth by 2 cups if you plan to make it this way again. Happy Cooking! Pingback: Creamy Chicken Fajita Soup - Read. Eat. Repeat. Made this on the crock pot and it’s amazing!!! Does the nutritional information listed include the rice? If so, any suggestions on what to subtract if I didn’t use any? Thank you so much! Delicious! Made this to freeze for lunch on these cold, cold days. I omitted the rice and used black SOY beans instead of black beans (really cuts down on the carbs!) It was wonderful and will definitely go on my “low carb keepers list” – thank you! Tried your recipe for Skinny Chicken Fajita Soup and it is delicious. Perfect blend of flavors and I love the fact that it is low in calories. This is a definite keeper. This soup was really great! Made it without the rice for low carb. Tasted wonderful! Delicious! My husband & I thoroughly enjoyed it! I’ve made this soup several times. I just love it. Now, with recent changes to Weight Watchers program, I can enjoy it with 0 points. That’s exciting!! Can you cook this is a crockpot rather than on the stove? What temperature and for how long? Please advise if the nutritional information shown for this recipe includes rice being included? I did not add the rice and I was wanting to track it in myfitnesspat app. Great recipe by the way. Great taste. Is it ok to use chicken breast tenders? Hi there–I am looking to make this but wanting to use a rotisserie chicken instead of raw. What would be the best way to add this in/cook time since the chicken is cooked! Made this for dinner tonight. My oh-so-picky husband loved it! I left out the rice because my husband has to be on a low carb diet. Have you ever used cauliflower rice instead? I’ve never made cauliflower rice before so I’m not sure how that would work. Made this a month ago. Made exactly as the instructions said. We don’t have fire roasted tomatoes in Australia so I used normal tinned tomatoes. I also added some extra chilli as my fiancé is asian and likes the heat. Didn’t need anything to garnish it with. Froze the leftovers and reheated again today. Turned out really good after thawing too. Will make again. Had with bread. Had to omit the rice and black beans due to carb restrictions but the soup was delicious!! I did add the extra chili powder and cumin for a more spicy flavor. Thank you for a wonderful easy recipe. Works great in an Instant Pot too!???? This soup is amazing this soup is very good I did make some changes I added green chilies and more meat and I added some mushrooms and more cumin the soup is excellent I highly recommended not too spicy and not hot. Can any other rice be used? Don’t usually buy brown. Have some Basmati on hand. How many cups are in a serving? Thank you! That’s how I measured it. Delicious lunch for a week!!! Making it in crock pot today. Loved the flavor, only draw back was my chicken was over cooked. Wondering if anyone has tried this in a crockpot? I finally made this soup last night and let me tell you, it was delicious! I used 2 lbs of chicken breast tenders (since I’m on a low carb diet and can use the extra protein), made the rice on the side for my S.O., and used pinto beans instead of black beans. I went the more robust route and added a medium jalapeno (diced), ancho chili powder, and cumin. It gave it so much additional flavor without making it spicy. We both loved it. I topped mine with sharp cheddar cheese and he used a couple flour tortillas to dip into it in place of crackers. This will most definitely be one of my go-to meals! I might even double the next batch, just for extra leftovers! This was so good! My nine-year-old had seconds. I deleted the rices but added a little frozen corn. 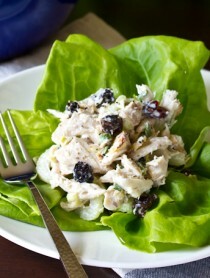 Hopped off with a dollop of sour cream and sliced black olives. Going to make more and freeze some for my mom!! My Family loves this soup! I split it into 2 pots on stove. My husband prefers a spicier version so I add Chili powder, cumin seasonings and Sprinkle Red Pepper flakes. My daughter prefers the original recipe. This is a weekly dish for us. This soup is delicious, so happy I tried it. I like to add the traditional cooked rotisserie chicken to save time and add flavor. What is considered a serving? 1 or 2 cups? Made this tonight… Huge hit with the fam!! Topped with homemade guac, tortilla chips and green onion ? I added the extra chilli powder and cumin and left out the extra 2 cups water (if you add rice.) Great flavours! This is just what I was looking for! Thank you!! Looks delish! Hi. Just made this soup; easy and we loved it. Will be making again. Thanks for sharing. Does anyone know how many carbs per serving this skinny fajita soup is? I made this without the rice and without the black beans (and it was delicious even without them!) and also only used one carton of chicken stock and a large can of diced tomatoes. My carb tracker totalled 10g for a pretty hefty size bowl (412g). This sounds awesome. Have you ever done it in the crockpot? You can make it in the crockpot, but you do need to sauté the onions in a skillet first. I can freeze this, right? Thanks! Yes, it freezes rather well! I wondered the same thing too so I went to a recipe calorie calculator and it says this makes 6 servings with each serving being 316 cal! This looks great! When I add the chicken, do I add it raw? Such a bowl of comfort! the flavors in this are fantastic! Sounds like a great family dinner! What a great idea! this soup sounds perfect! I know what’s for dinner tonight! !